The China Arena Football League officially announces their premier achievement awards for the 2016 Super Series season, which concludes Sunday November 6 in Shanghai with the China Bowl for the CAFL championship. 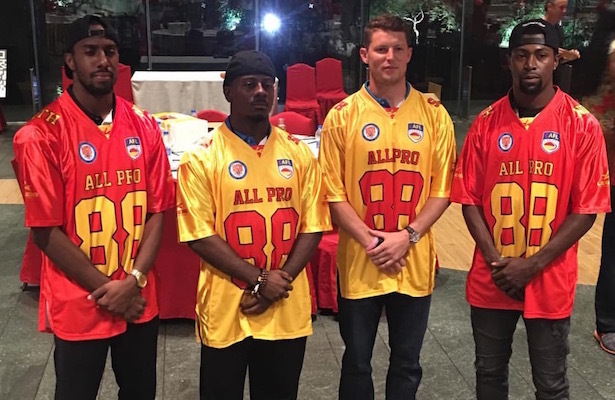 At halftime of the championship tilt, the CAFL MVPs, All-Pro teams, and the 2016 “Dream Team” will be introduced to the fans on hand, and an international television audience. Ken Bozarth, the league VP of Operations took to the microphone and the results of the balloting at a special season-ending dinner at the league headquarters, the Doubltree Hilton in Shanghai. “We spent a great deal of time discussing and analyzing these awards” said Bozarth. “We were looking for players who excelled on the playing field, but also as leaders on and off the field in our first ever season here in China.” The premier awards were handed out by Bozarth in four categories: Offensive MVP, Defensive MVP, Steel-man (all around excellence at several positions) and the Judge Spirit Award, named after CAFL founder Marty Judge and exemplifying football excellence, leadership and special contribution to the league. Offensive MVP: Shane Austin, QB, Shanghai Skywalkers. Austin will lead his team into Saturday’s third place matchup versus Guangzhou as the league leader in total yards, and is near the top in very passing category. Defensive MVP: Torez Jones. The Wilson, North Carolina native almost didn’t make it to China. Signed as a free agent, he was the last player to make a CAFL roster, but ran away with the vote. A defensive back for Beijing, Jones already has been part of 13 takeaways, with 6 interceptions, and 7 fumbles caused. Steel-man: James Romain, Beijing Lions. Teaming with Jones where he will play in the China Bowl Sunday, the sensation defender has 4 interceptions of his own, but has hauled in 9 touchdowns in Clint Dolezel’s offense as a receiver, and has returned kicks and interceptions for touchdowns. Judge Spirit Award: Mike Washington, Shanghai WR. Washington has dazzled with 12 catches or touchdowns, most of them of the long distance variety, many of them spectacular runs after the catch. He helped attract international attention for the CAFL with his joyful post-TD dance celebrations, causing an internet sensation. Washington was a A tireless ambassador on the tour for the CAFL off the field. CAFL MVP presented by Xenith from league statistics.